To use xEvent, you must be running DNN 8.x or higher. We have tested it with DNN8.x and DNN9.x. Navigate to find the "DNNGo_xEvent_x.x.x_PA.zip" file on your computer and click "Next" button. 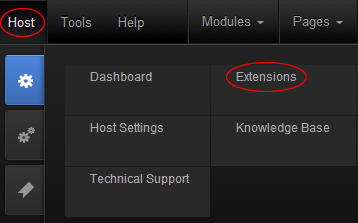 This is the most used features of xEvent module, with this feature, you can add new event or edit them. You need to fill in title and content of the event, summary part is optional. First please go to navigation of the Address on the left to add address list. Then you can select an added address here. Rating number for event can be set here. Here you can set about sitemap options for each post, these options will reflect in the sitemap url provided by "General Settings" interface. 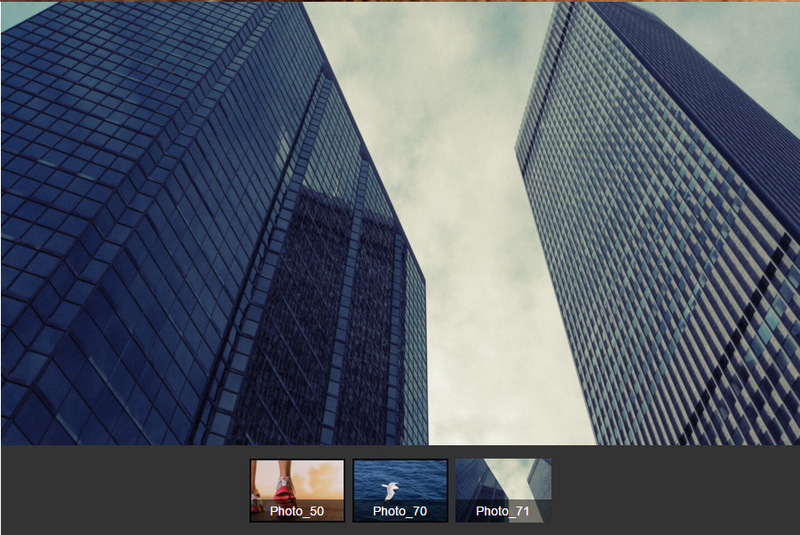 Here you can control Gallery and Attachments display of article detail page. You can fill in SEO Content selectively, when not being filled in, it will automatically generate using built-in rules of xEvent. Friendly Urls can change the URL of post detail page, however please note that you can not fill in the characters which url rules not allow. 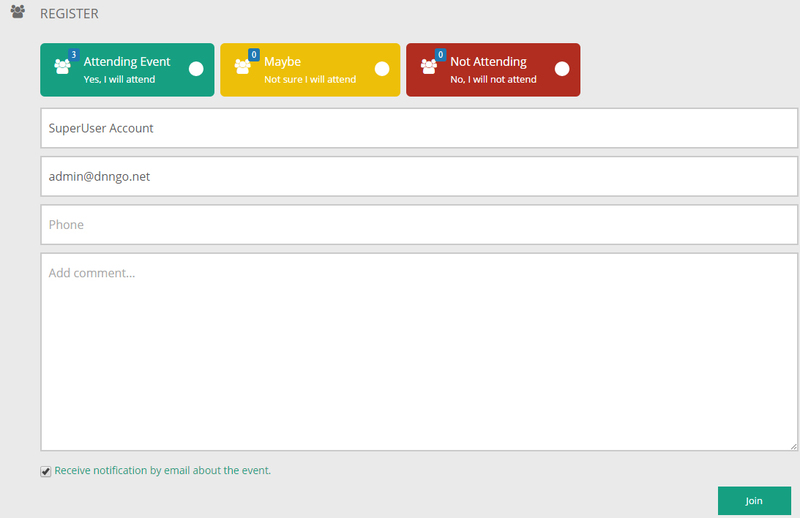 Status for event can be set here, either to display or hide. Display time for event can be set here. All Day Event - All Day Event-Set event to be one that lasts for all day. Start - Set the start time and end time for event. If set it All Day Event, then hour, minute and second will be disabled. Repeat - Set repeat rules for event. More options - Set more complicated repeat time. Color tag for event can be set here. Category for event can be set here. Tag for event can be set here. Featured Image is the main picture of the post, this image will show in article list, article details and xEvent.Dashboard. These images will display in slider form in article detail page. 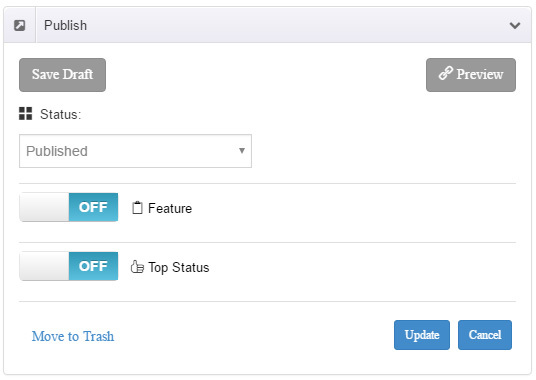 You can set article permissions, whether to be accessed by all users or some of these roles. 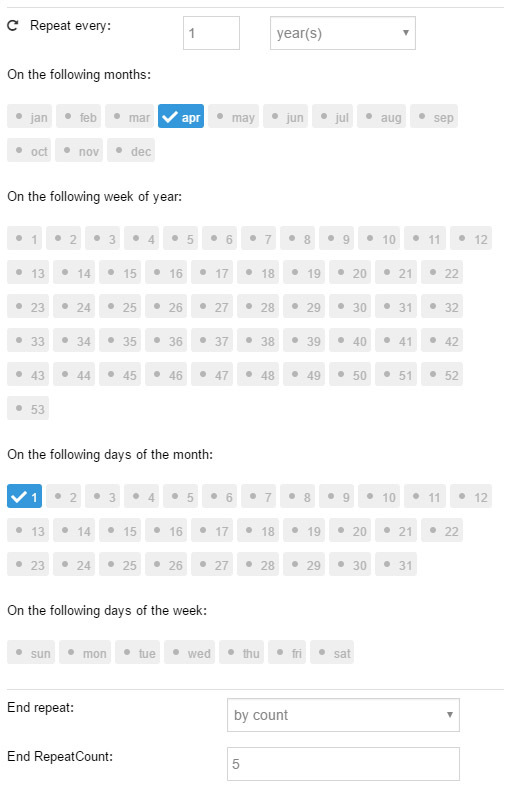 If you choose to set only some roles can access it, you need to have "All Users" unchecked. Author for event can be set here. 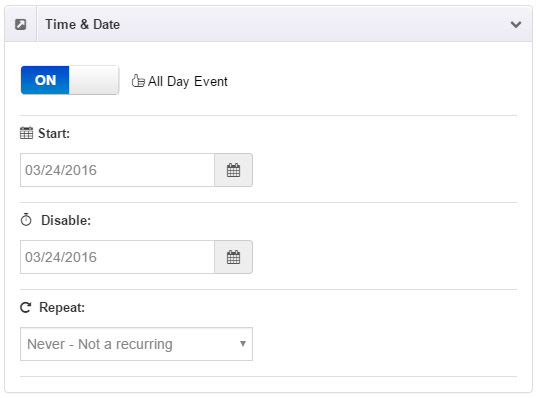 In this interface, you can manage all event, single or bulk actions.You can search out the post you need to edit based on the post title. You can check the Tags entered by the events, for Tags shown here, you can add or delete. 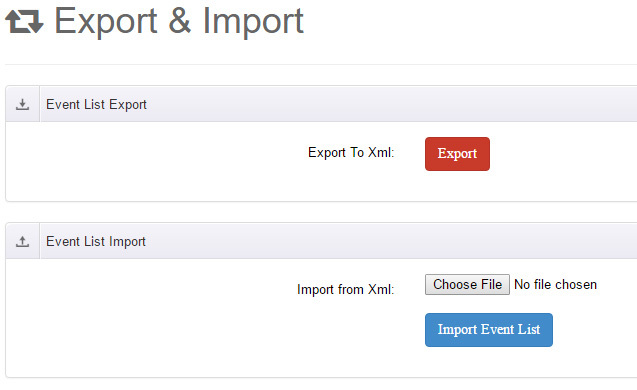 You can export all content with proprietary format, but it just works with data import/export between xEvents. Address list can be added and changed here. Longitude/latitude/zoom - Location of the map can be set through longitude and latitude. Zoom is used for setting zoom level of the map. Goole Map Address - Set location of the address through the specific location. MarkerIcon - Set the marked image on the map. Marker Text - It will show these texts when mousing over the marker. 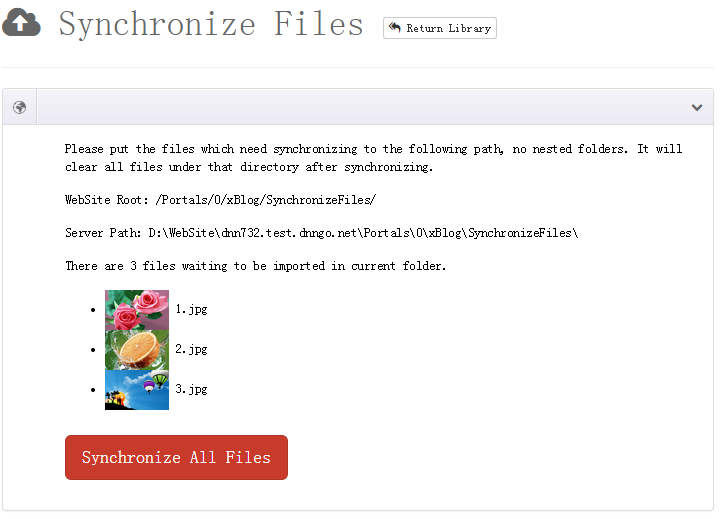 You can redirect to two interfaces of adding files through "Add New" or "Synchronize Files". 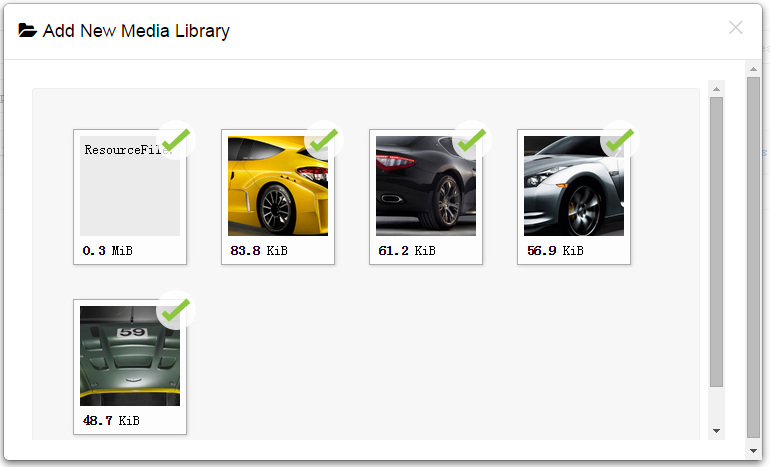 All images of xEvent module will display here, all xEvent module images under single child site are shared. 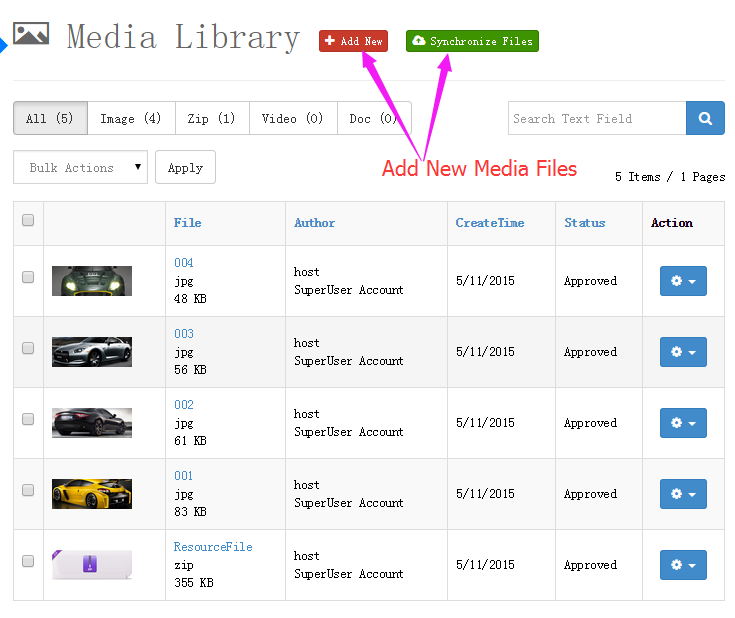 If you have more files to upload, the method above is not that helpful. At this time you can try this method. Put the files need importing into specified folder, it will prompt number of the files to import after refreshing the page, click "Synchronize All Files" button and everything is done. 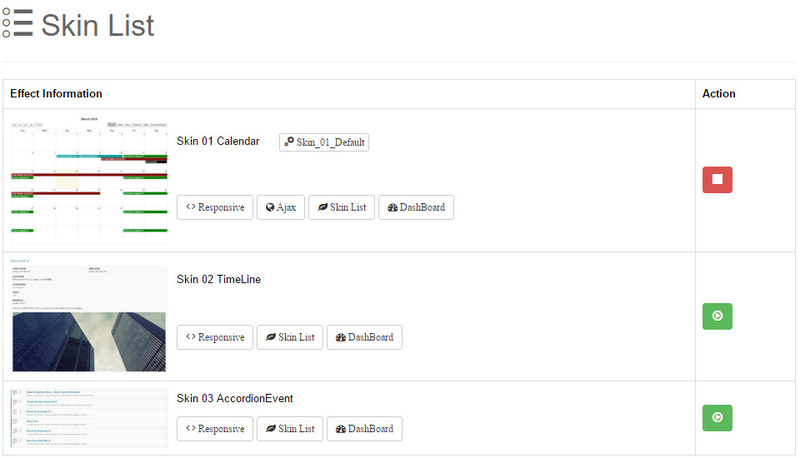 You can set the skin to be displayed in front end, here we are offering 3 skins. You can set this skin option after the skin is set, you can hide and display elements in the skin. 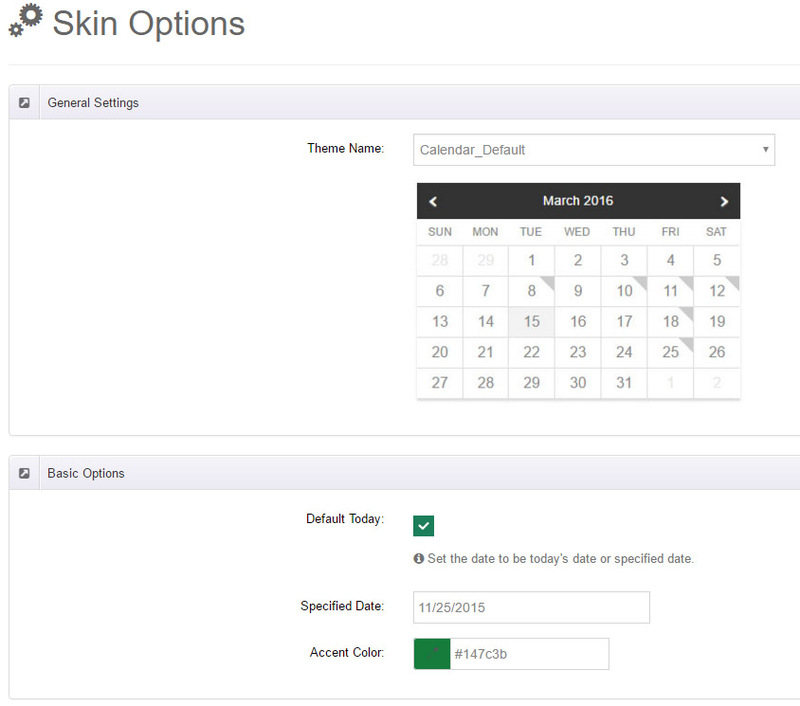 Here you can set the skin that module is to choose, each skin has its own features and options. You can export current skin to edit, and then import. 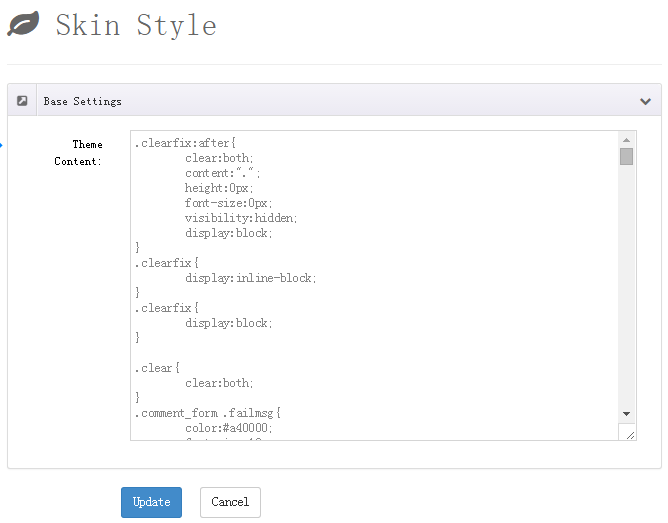 To edit skin you need to have some certain level of HTML programming . Or you can edit these \DesktopModules\DNNGo_xEvent\Skins in web directory. You can set the skin for the detail page of article. 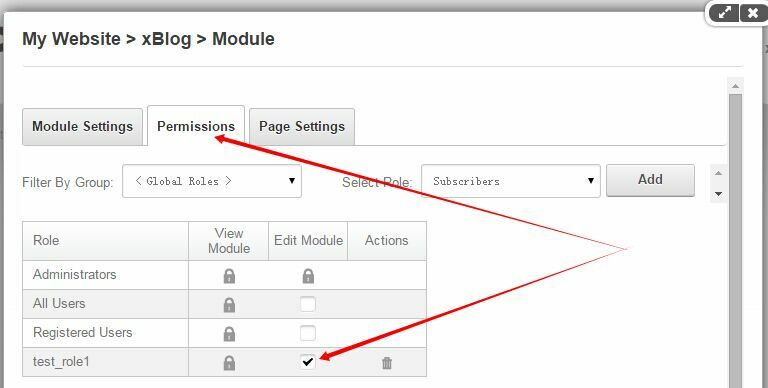 Here you can find most setting options of the module, we have categorize setting options, making it easy for you to find the option you would like to set. Author Roles - Author permisson needs to give this role to module edit permission. Review new event - Set whether the article posted by author needs reviewing by administrator or not. Manager Module Roles - Set administrator for event module. 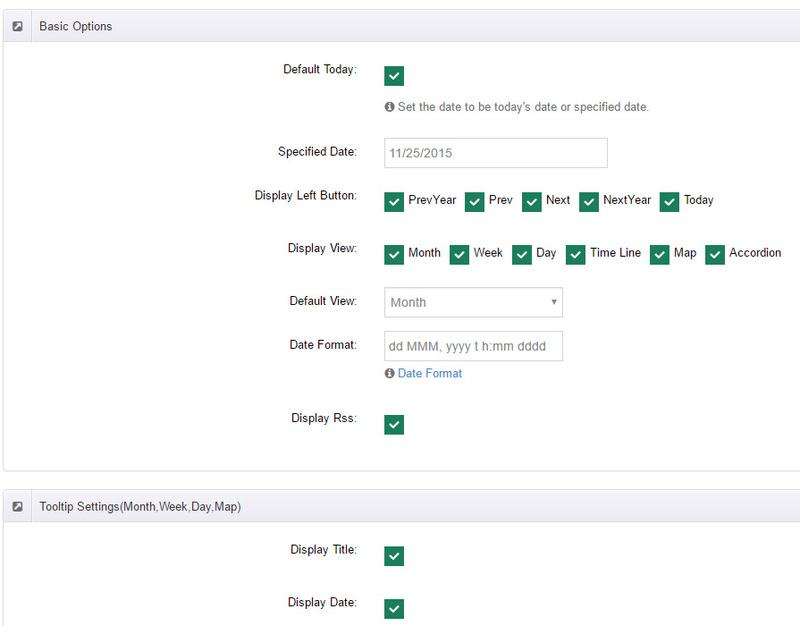 Fill in the name of user role who can manage the module, type one role name each line. 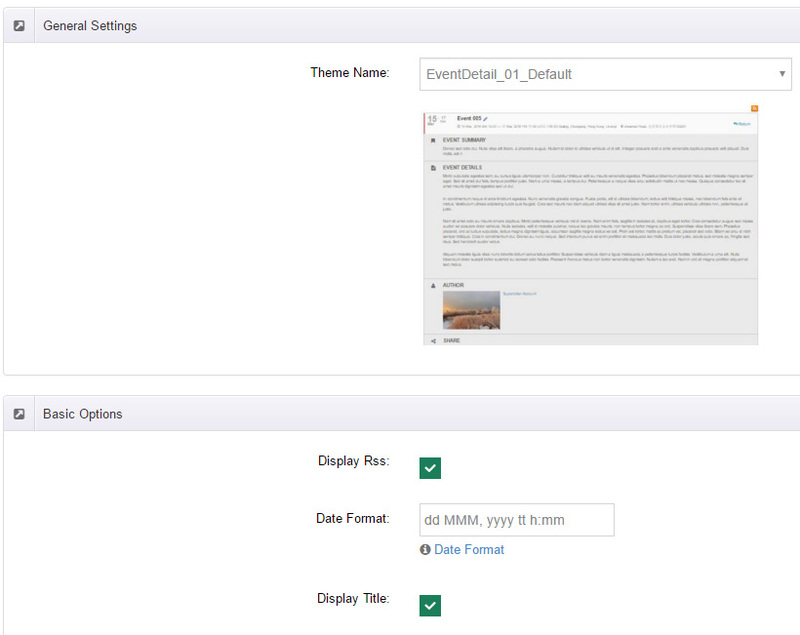 You can set some parameters of RSS feeds, you can control the number, display module and RSS stylesheet. You can set parameters for output Sitemap. The API of Disqus has been used for module, you need to register a relevant account at disqus.com and set Disqus Short name. All feature setings are from disqus.com. 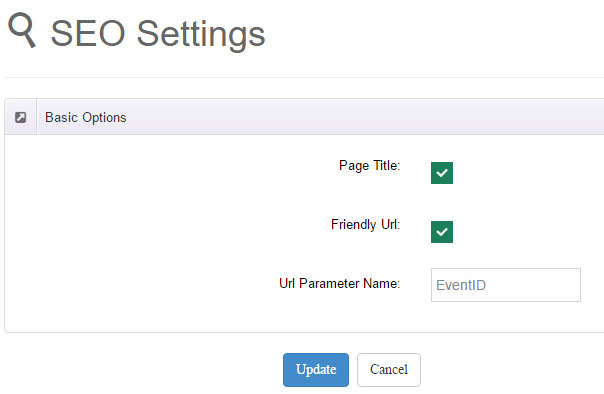 Set rating feature, which will show in the detail page of Event. You can set whether to display Page Title for article detail. You can replace URL of article detail page with custom URL. Enable Registration - Turn on registration feature. Need To Login - Allow anonymous users to register events or not. 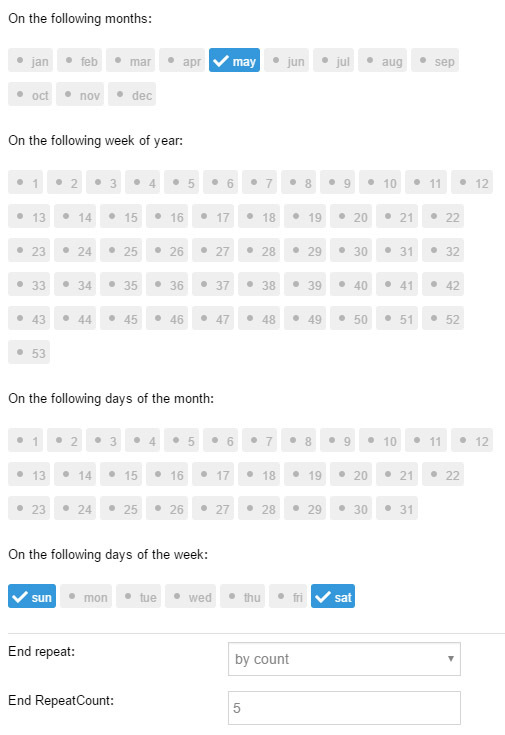 Module allows DNN registered users and anonymous users to join event of a certain period. Users can register at the event detail page. 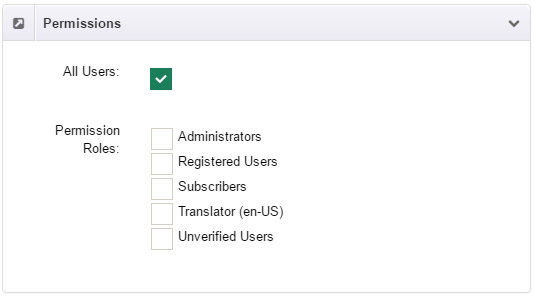 Administrators can check all of the registered user at the back end of module. 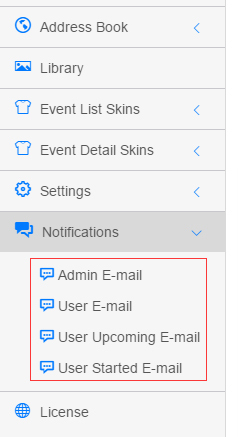 Both administrator and the user will receive reminder email after user finishes registration. 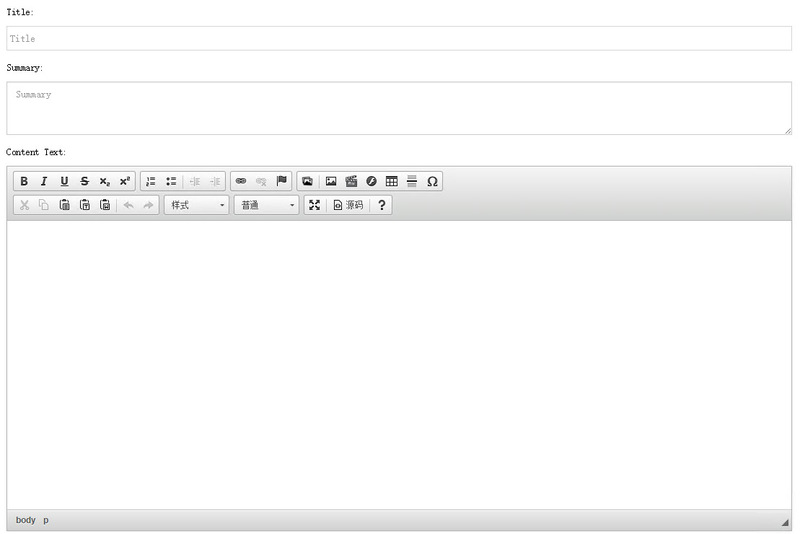 Email templates to be set in Notifications. 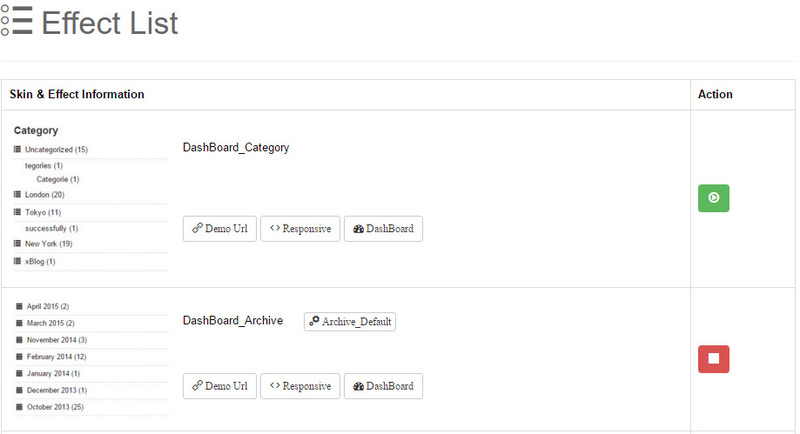 xEvent Dashboard is the affiliated module of blog module. 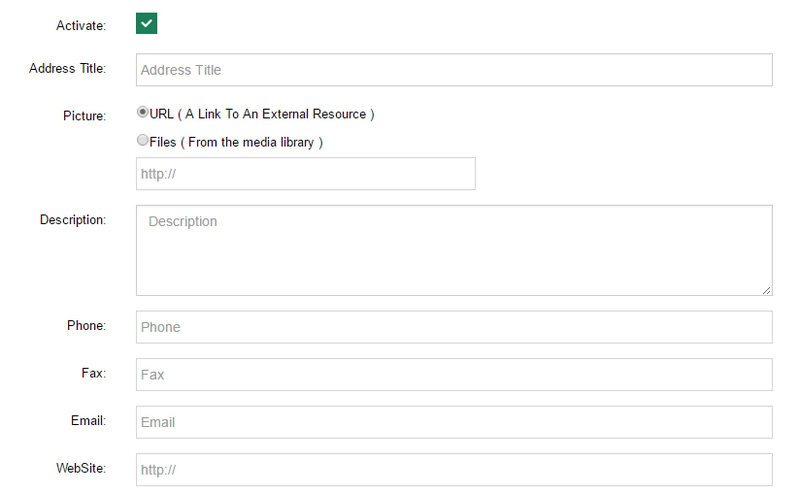 With this module, you can display category, archive, tag cloud, sliding effect, latest articles, etc. 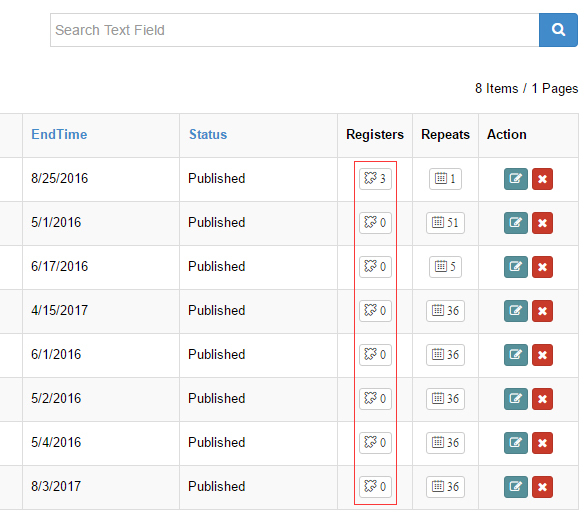 After installing xEvent Dashboard module on the page, you will be prompted to redirect to setting page and xEvent main module for binding . Click [Settings] in prompt statements, it will redirect to setting interface quickly. After setting binding relationships, you can set the use of this module. We have integrated various features here, for example, category, archive, tag cloud, latest article etc. In addition, it includes more than 10 kinds of different article display effects, you need to select the feature you need based on the description and images. Rich settings are included in each effect.